In a new report, Highway Boondoggles 2, U.S. PIRG and the Frontier Group profile the most wasteful highway projects that state DOTs are building. 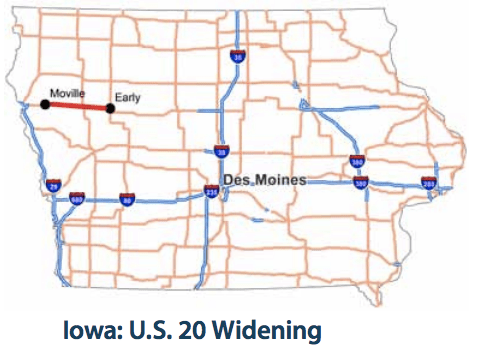 Today we highlight the proposed 40-mile widening of U.S. 20 in Iowa, which will cost many times as much as fixing all the state’s structurally deficient highway bridges. In June 2015, the Iowa Transportation Commission, the public body that sets the state’s transportation priorities, voted to spend $286 million on widening 40 miles of U.S. 20 between Moville and Early from two to four lanes. The road passes through a rural area of northwest Iowa where population has barely changed since 2005, and isn’t expected to change through at least 2040. State transportation officials want to draw more truck traffic to and through the area, diverting some of the congestion now facing I-80 to U.S. 20 instead. The state is saying the road needs to be built now to accommodate traffic that may develop more than 20 years into the future. Yet its projection of future traffic anticipates vehicle travel increases on that section of road far faster than recent data suggest. The existing two-lane rural highway can handle the traffic volume expected in 2039 in most locations, based on actual recent traffic growth. Iowa’s highway design guidelines for two-lane rural arterials specify that they can handle more than 5,000 cars a day. If the 2011 through 2014 average growth rate were to remain stable through 2039, four of the nine relevant traffic counters on U.S. 20 would not see numbers exceeding 4,751 and a fifth would be at 5,154. Iowa’s highway design guidelines are not as specific as other states, but according to Wisconsin’s highway design guidelines, the existing road could handle up to 8,700 cars a day. Only one of the nine traffic counters, east of Correctionville, would see daily traffic exceeding that level in 2039. To the extent that segment sees such a traffic increase, more localized solutions could be explored, rather than widening miles upon miles of highway two decades in advance. Editorializing in support of the bill, the state’s largest newspaper, the Des Moines Register, wrote that the “money is needed to meet the most critical needs on Iowa’s 114,000-mile road system, where many aging roads and bridges need repairs, according to state studies.” And yet, very little of the $500 million in new revenue is being spent on fixing pavement and bridges. Just more than three-quarters of the money is going to projects that expand highways, the biggest of which is the U.S. 20 expansion. 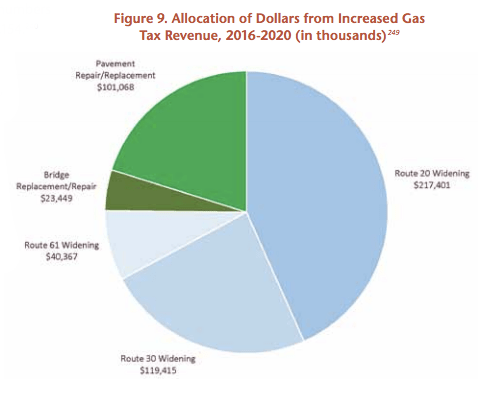 The U.S. 20 highway expansion project will eat up more than 40 percent of the gas tax windfall — $217 million — to the exclusion of other pressing needs. The remaining $69 million being spent on the project from other state transportation funds could also be used to improve the state of Iowa’s roads. Rebuilding all 62 structurally deficient bridges on the state’s federally funded highways would cost $61 million. Even the head of the state’s transportation department knows spending so much on highway expansion is the wrong direction for transportation spending. In July 2015, Iowa Transportation Department Director Paul Trombino said the state’s existing road system was already bigger than could affordably be maintained. “We have to shrink the system,” he told the Cedar Rapids Gazette. He called for using the gas tax money not as a catalyst for spending billions more on new construction, but rather to fund badly needed repairs to existing roads and bridges. His plea came a month too late: The State Transportation Commission, which determines the priorities of projects Trombino and his department must undertake, had already approved the U.S. 20 widening. Could become a new east-west Interstate (I-84? ), but has been done piecemeal as a duel carriageway with potentially dangerous dirt shoulders.